Samsung Pay allows your smartphone to make payments virtually anywhere you can swipe a payment card. For more info on participating banks and carriers, device placement, etc., visit the Samsung Pay support page. To use Samsung Pay, screen lock must be enabled. From any screen, press and hold the Back button. Enter the screen lock pin to unlock the device (if prompted). Rotate the bezel to select the desired card. Hold the Gear near the pay terminal to pay. 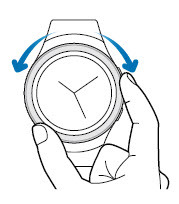 For best results, hold the upper edge of the Gear S2 toward the terminal. Samsung Pay is compatible with most magnetic credit card payment terminals. If necessary, complete the transaction on the payment terminal (e.g., enter debit card PIN, verify charges, etc. ).